Boasts a state-of-the-art convention center, approximately 10,000 sq. 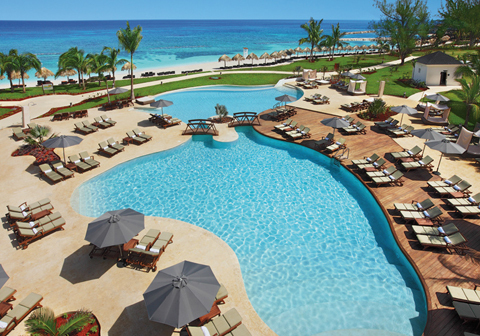 ft.
Every detail of your Montego Bay island retreat is thoughtfully considered. Spacious Junior, Grand, Master and Presidential Suites complete with all of the elements for relaxation and reconnection with your companion, led by your gorgeous view of the Caribbean ocean. 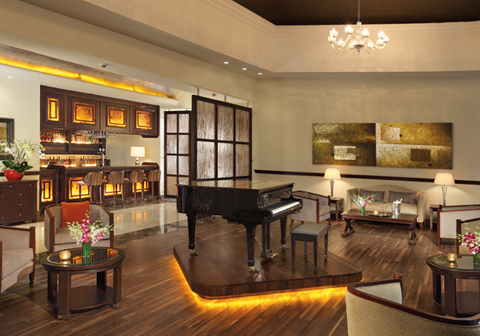 All 350 luxurious suites feature British colonial décor and a lavish array of amenities. 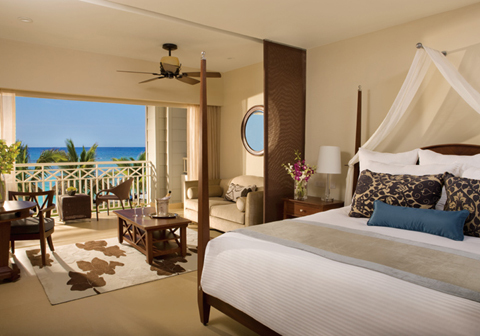 The Junior Suite Ocean View offers all of the above amenities with lush garden views. 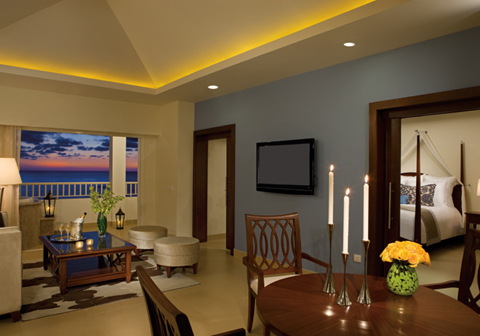 The Junior Suite Oceanfront offers all of the above amenities with spectacular views of Caribbean Sea. In addition to the above amenities, the Preferred One bedroom Suite with Ocean Front View, with a Jacuzzi for four, walk-in closet, dinner table for eight guests, kitchenette, small refrigerator, microwave, living room seating eight guests, bar, entertainment center including a 42” flat screen LCD TV, DVD, stereo system, and an office space with a desk, computer, and cordless telephone/fax. Offering guests the opportunity to dine at a total of 10 restaurants: 1 buffet, 7 à la carte, a grill and a café. Seven restaurants are located in the Promenade, one restaurant located in Secrets Wild Orchid and one in Secrets St. James. No reservations are required. All restaurant openings rotate throughout the week. Number of restaurants open for each meal is dependent upon occupancy levels. Barefoot Grill | Lunch 11:00 a.m. – 6:00 p.m. Serving hamburger, hot dogs and other snacks. Blue Mountain | Dinner 6:00 p.m. – 10:30pm. Bordeaux | Dinner 6:00 p.m. – 10:00 p.m.
El Patio | Dinner 6:00 p.m. – 10:00 p.m.
Himitsu | Dinner 6:00 p.m. – 10:00 p.m.
Oceana | Lunch 12:00 p.m. – 4:00 p.m.; Dinner 6:00 p.m. – 10:00 p.m.
Portofino | Dinner 6:00 p.m. – 10:00 p.m.
Seaside Grill | Lunch 12:30 p.m. – 5:00 p.m.; Dinner 7:00 p.m. – 10:00 p.m.
World Café | Breakfast 7:00 a.m. – 11:00 a.m.; Lunch 12:30 p.m. – 3:00 p.m.; Late night bites 11:00 p.m. - 2:30 a.m.
Offering 9 bars and lounges, serving premium brand domestic and international brand beverages and top-shelf spirits, ranging from swim-up to a nightly music lounge. Sugar Reef | 10:00 a.m. – 6:00 p.m. 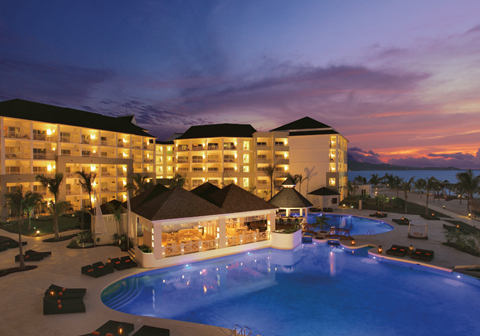 The Promenade, accessible to guests of both resorts, is the place to see and be seen each night. Guests can choose from Desires Music Lounge, the Piano Bar or catch a live show at the open-air theatre with bar service. All bars, no matter the location, offer a variety of top-shelf spirits. Desires | 10:00 p.m. – 2:00 a.m.
Marlin Bar | 10:00 a.m. – 6:00 p.m. Piano Bar | 5:30 p.m. – 1:00 a.m.
Revive Bar | 8:00 a.m. – 8:00 p.m. 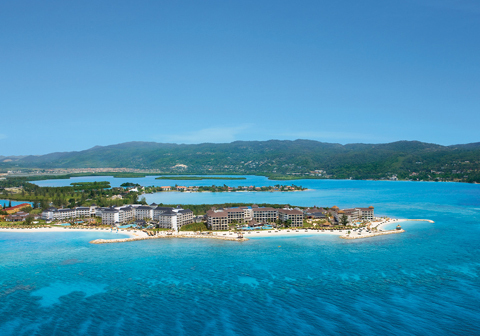 The Lounge | 10:00 a.m. – 1:00 a.m.
As part of the privileges of Unlimited-Luxury®, we’re offering guests of Secrets St. James Montego Bay the chance to Sip, Savor & See at Sunscape Splash Montego Bay & Sunscape Cove Montego Bay. Enjoy dinner and live entertainment at participating sister properties including sipping complimentary cocktails, savoring delicious cuisine at the restaurant of your choice and the opportunity to see that evening’s entertainment. The Sip, Savor & See Dining Experience is only good for dinner at a qualifying sister resort. This is not a day pass. Guests must make arrangements through the Resorts’ concierge by 3 p.m. Guests may choose to dine at any of the restaurants that are serving dinner. Guests are responsible for the cost of transportation to and from the resort. A maximum of 4 people are allowed per seating. Special restrictions may apply for Christmas, New Year’s Eve dinners and special events. Guests can utilize the facilities at the resort they are visiting from 6 p.m. to 1 a.m., including bars and theatre. 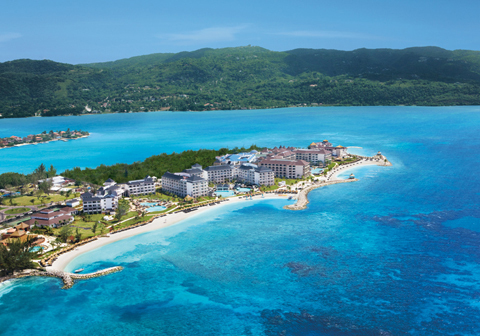 Montego Bay is the Jamaica's second largest city and top tourist destination. Located in the northwest region of Jamaica, it offers several nearby attractions, duty free shopping, a cruise line terminal, and multiple beaches, all with a backdrop of low, picturesque mountains as well as the vibrant Jamaican culture and the Rastafarian heritage. The famous "Hip Strip" offers daytime shopping, featuring local handcrafts, and exciting night life. Montego Bay also boasts old sugar cane plantations, the most famous of which are White Witch’s Rose Hall and Tryall, featuring original buildings and mill-works along with world-class golf courses. Rose Hall Great House – A legendary great house, Rose Hall is known for its history and tales of being haunted. 10 mi./30 min. Dolphin Cove – Enjoy interacting and swimming with the dolphins at this exciting adventure. 45 mi./90 min. Dunn’s River Falls – This major Caribbean tourist attraction is a great day trip for couples, families and friends with its massive waterfalls. Guests enjoy climbing to the top of the falls and swimming in them. 45 mi./90 min. Rick’s Café – Rick’s Café was the first bar and restaurant of its kind built in a small fishing town with little modern development. The restaurant is known for its deep history and location alongside a cliff showing beautiful Jamaican scenery. 40 mi./90 min. Scenic South Coast – Located off the beaten path of Jamaica, the South Coast is known for its privacy and miles of beautiful beaches. 40 mi./120 min. The Promenade: The Promenade, conveniently located, includes an array of shops, gourmet à la carte dining options and a state-of-the-art theatre offering a variety of nightly shows. Step inside our luxe members-only U-Lounge! You'll get to enjoy special amenities including a lounge area, light beverages and snacks, complimentary internet access, books, DVD rentals and more. Your dedicated Member Services Executive there to help you reserve your Amstar or resort services, make payments or future reservations and so much more! 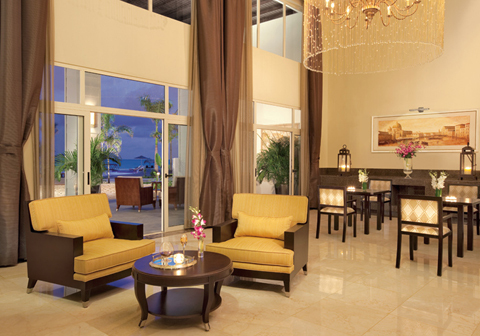 Located adjacent to the Spa, guests as well as outside patrons will have access to the Seawind Beach Club. Not included in the Unlimited-Luxury® privileges, this spacious area is complete with a large swimming pool that includes a swim up bar, a children’s pool, palapas, lounge chairs, couples cabanas, an exquisite bar and is home to the Calypso Restaurant offering contemporary Caribbean cuisine. Seawind Beach Club is perfect for intimate, private occasions with stunning sunset views and beautiful beach set-ups. Children are allowed access to all facilities in the Seawind Beach Club. 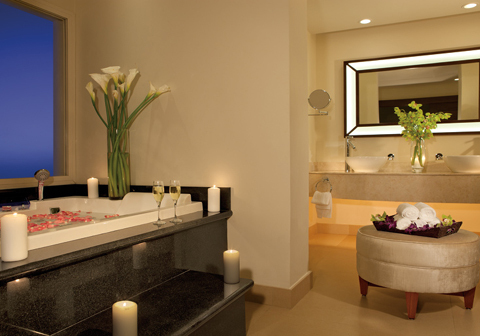 Located near the Beach Club and accessible to outside patrons, this world-class spa (15,000 sq. ft/1,394 sq m) is like a magical garden, rich with lush gardens and fountains. Massages of every style by true experts, saunas, body treatments and private Vichy showers allow you to indulge in every desire.